Be ready to get nostalgic with anyone who see's you pull up! What if your on a budget but don't feel its fair you should have to settle for less? We have introduced a better deal and actually is faster than any other 50cc moped on the market. Save a ton of cash and have a blast showing off while your doing it. Fast, Fun and our most affordable scooter online. This model has full parts support and is supported by CMS MOTORS. If your looking for a new moped and don't have alot of money but still want power and quality. This unit IS the one. This is a very nice quality college cruiser and at a price that is unbeatable. The perfect A-B cruiser. Need to get around? The Euro 50 Scooter is just made for that purpose. Whether it's just a run to the store or errands, the Euro 50cc Moped is the most reliable and fuel efficient form of transportation there is. The Euro uses 4 stroke engines so it is not only quiet but also environmentally friendly. The Euro is here to appease those who loved the Vespa design. New to this season. 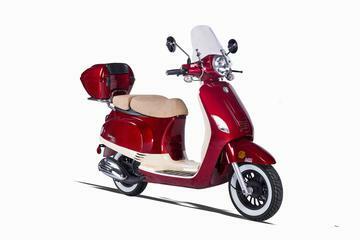 The limited edition has the latest technology but with the classic Vespa look. Equipped with the new 4 stroke engine it sure runs a lot quieter and cleaner than before. A security alarm has been added with the unit to make sure no one touches. This is the limited edition so hurry! Disclaimer: The rated fuel efficiency for this vehicles in MPG (miles per gallon) may vary according to the traffic & road condition plus the weight of the driver and passengers. The maximum rated speed may vary according to road conditions plus the weight of the driver plus passengers if any. BE A RESPONSIBLE RIDER! FOR SAFETY, READ YOUR OWNER'S MANUAL. ALWAYS WEAR A HELMET, EYE PROTECTION, AND PROTECTIVE CLOTHING! NEVER RIDE UNDER THE INFLUENCE OF DRUGS OR ALCOHOL! ATV's - Parents consider your youngster's age, size, ability, and maturity before allowing them to ride. SCOOTERS, MOPEDS & MOTORCYCLES - Never ride on non-paved streets or non-public roads, and never carry passengers on your moped unless equipped to do so. Never engage in stunt driving or ride at excessive speeds. Be careful on difficult terrain. Riders under 16 years of age must be supervised by an adult. CountyImports.com recommends that ALL riders take a training course. For more information visit the ASI website safety.org/. We have a put together a great collection of actual course study information, videos, and guides. You can have your children watch our atv and four wheeler safety videos anytime for free! The 4-stroke scooter has been proven to be as efficient and reliable to competitors such as Honda and Yamaha. This streamline design motor is optimized to be extremely fuel efficient yet tuned to perform with maximum torque & power. Equipped with the leading Japanese components such as spark plug and throttle-body designed carburetor, no primer button or choke lever to mess with. All Countyimports.com products carry these 4 stroke motors, upgraded drive belts, chains, carburetors, electrical and lighting. You will notice, many competitors sell similar products but for the same price, why not get all the great upgrades we include standard! Not just in stock but viewable online! We know there is so much more to just buying a wholesale gas motor scooter or moped. As a veteran dealer with over 5 years of online shipping experience, we have built our company with a stable foundation. Carrying parts and the ability to easily find what you need is more important than just the initial sale! With that statement, we naturally are willing to back up our comments with a fully functional, automated and user friendly department just for you the customer! So, when it's time for your first service and if you ever need anything from a spark plug to a tire. We've got you covered. With over 60,000 parts in stock at the click of a mouse you are rest assured when you need it, we've got it! You have nothing else to worry about! That is our promise to you. The shipping carrier, UPS Freight, Fedex National, SAIA or any other carrier we use will call you 1-2 days before delivery to arrange a "block time" for delivery to ensure you are present for delivery. Please watch your phone and e-mail carefully 5+ days from the date of order. These mopeds are specially designed and manufactured to be sold online. They have special packaging (minimize shipping damage and missing parts), every scooter is tested at the factory (real test ride, not just started), your warranty is NOT void if you assemble it yourself, you get free tech support from the manufacturer, the scooter is delivered virtually fully assembled. Shipping takes anywhere from 5-15 business days depending on your location. We do offer other custom shipping methods during checkout. Express shipping, gift receipt, and business delivery are also options we offer! Please remember that by purchasing a moped online, you are responsible for performing the setup that a dealer would normally perform - such as checking the tires, hooking up the battery, checking the tightness of all nuts and bolts, changing oil, etc. Although we do provide some very good information and assembly manuals; occasionally some units may need other routine items checked/adjusted such as adjusting the carburetor idle and mixture screws, checking to ensure wires are well connected, adjusting chain slack and alignment, if needed. Since you are skipping a dealer and saving over half the price of a usual retail customer, you will need to perform the final assembly (as stated above). This will take generally 30-90 minutes to perform depending on your vehicle and skill level. While we will gladly assist you with any technical questions, we will not refund or exchange your unit if you cannot perform these functions or refuse to let a shop do it for you. By placing an order with CMS you agree to these terms. If you would like a dealer to perform the assistance and easy set-up for you, we have one of the only brick and mortar dealer networks to assist you with this function for a fee. Contact us with any questions. We know you work hard for your money. We also understand the need for peace of mind in a purchase. Now, you have the power to customize your own warranty protection to fit your needs. As a standard, we always offer a free warranty for every single product we carry. We also carry parts for these products. After over 5 years and over 25,000 customers served, we know what coverage will best serve you the customer. When adding this item to your shopping cart you will be asked to select your warranty coverage. Remember, there is always a FREE standard warranty offered with every purchase, however, we also offer longer coverage periods. Please keep in mind you must PRINT OUT the warranty agreement, sign, and mail -or- fax it to our office to become active. We suggest you complete this and mail it while waiting for your new unit to arrive! This way from day one you are covered! Here are the following warranties available. Please note any warranty offered is a parts only warranty. Unless you purchase directly instore from CMS or can bring your machine to our location for service. This warranty however long the term you select will cover everything noted HERE. Please feel free to contact us for assistance or with questions. NOTE: We've run a survey of what customers want to see us offer. We've listened! This option is offered by this website and no other dealer. Thus, this warranty, parts, and service offered must be with CMS LLC. If you chose to have a different dealer perform service or warranty work you must ensure the dealer provides a company letterhead draft of the parts needed to certify the claim. To file a warranty claim please go here. Generally, no other site offers any extended warranty coverage and thus we must ask that you follow our simple protocol or contact our staff for assistance. Remember, our standard warranty is still 3 times that of any competitor! For over 12 years, we have gained tremendous experience serving thousands of customers in high dirt bikes, go karts, and scooters. Our knowledgeable staff is enthusiastic, helpful and courteous; we have a great attitude and want your business. We care about our customers and make ourselves easily accessible. Our toll-free number is 1-877-300-8707. Your satisfaction is our #1 concern. Why get yourself all frustrated & try to get hold of a company never answers the calls? Pick up the phone dial our Toll-Free 877-300-8707. We guarantee you will find the best customer services here you deserve. Help and advice is only a quick e-mail or phone call away. When you contact Scooter Depot, we have a fully-staffed Sales Department to assist you. We keep you updated after you place an order with us. You can also use our Easy contact form to get questions answered fast. We are open 7 days a week from 9:00 am to 6:00 pm PST, and e-mails are always answered within 24 hours, usually within a few hours at the most! ?Our Live Chat Sales Representatives stay online during our normal business hours to assist you with any questions and concerns you might have and guide you through the process of completing an order. If you ever have a problem, you can rest assured that we will be here to help you out. We also offer a volume discount, the more you buy, and the more you save! For more details check with one of our live sales representatives during our normal business hours: Monday - Saturday 9am-8pm PST. We stock all common parts for all the products we carry. Call us at 877-300-8707 and get your warranted replacement part(s) shipped free of charge. If you purchased your Dirt Bike, Scooters or Go Kart from us - you are special and will be given that special treatment each and every time you come back. We offer replacements parts at extremely low prices even if your warranty has expired! Just FYI, if you have any frustrating friends, co-workers, family members are looking for replacement parts that they could not get from where they bought their bikes from, have them call us! We provide 80% of the spare parts on the market, not just to end users, even the dealers! Unlike most of the On-line companies, we ship our products directly out of our own warehouses. We display all the models we carry in our showroom. Our will call center open Monday - Saturday. We are a DMV licensed and bonded motor Dealer in CA. We served over 30,000 customers and 600 dealers nation wide over the past 6 years. All of our products are well protected and shipped in a metal frame. We inspect every item before it is packaged and shipped from our warehouse to make sure you will receive the best product possible. 9. We support our Troops! ¨C Exclusive Military and law Enforcement Discount: Supports Our Troops! We know you're job is tough that's why we make it easy for you to order the products you need and get it to you as quickly as possible. For more information, please contact one of our sales representatives at 702-351-0173 or see our FAQ page! Our Scooters also are known as Mopeds are powered by a 4-stroke engine for ultra smooth, efficient, and quiet transportation. 4-cycle engines are much quieter in operation than the 2-cycle engines found in most scooters and much more environmentally friendly. Roketa is one of the best engineered gas motor scooters in its class. This version of the Roketa gas motor scooter is the perfect choice for short distance commuters or for those looking for quick, easy and fun transportation at an incredibly affordable price. Features include electric start, lights, turn signals, mirrors, below seat storage compartment, horn, odometer, speedometer etc. These scooters are sold factory direct bypassing the middle man to save you thousands of dollars. We also sell these to the public lower than most dealers pay buying quantity. Beware of copy cat models sold locally and online, the brands CMS carries are manufactured by one of the largest motorcycle manufacturing facilities overseas. Copycat models come from small factories and assembly lines that use inferior parts. All CMS models are tested for durability and value. This is why CMS has become the premier online dealer serving the entire USA! Are the publicly traded? Do they have 3 Physical Store locations? How about a parts department with over 60,000 parts in stock? We may be bragging a little but we are very proud of our company and what we offer because we know out right, no one else can asker yes to those questions we can! Most other online dealers will ship your scooter to a terminal which could be hours away from your home, ours get shipped directly to your door. CMS also provides lift gate service at no additional charge. This means your new purchase will arrive directly to your residence at NO EXTRA COST! CMS offers our product at a wholesale price. For each items specifications and assembly requirements please see each individual item description for what assembly is required to complete this purchase. Although assembly is generally easy depending on the model if you cannot perform this task please let CMS know so we can help find a dealer in your area to perform this task. Should you have any questions about our product feel free to call us anytime during normal business hours M-SAT 9 am- 5 pm PST - 702-351-0173 . Please GO HERE to our FAQ department. The continuously variable torque converter transmission always provides just the right amount of power. The high torque of the 4-cycle engine provides more than enough power to climb just about any hill you will ever encounter. Carburetion is 15mm and CV with automatic choke. Also has Ignition CDI & Kickstart. Operation is extremely simple. Speed is controlled by the twist grip throttle. There is no clutch to operate as the drive system is completely automatic. This vehicle holds 1-1.5 gallon of gas, giving your moped a range of 70-115 miles, depending on rider weight and terrain.